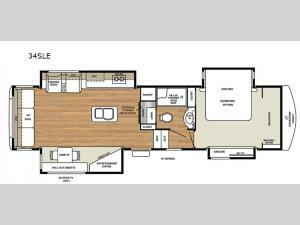 It's time to do camping the right way with this RiverStone Legacy fifth wheel! You won't even believe the amount of luxurious details that have been added into this unit, like the kitchen island with double sinks and the 60" LED Smart TV with a Bose Sound Bar and DVD in the living area. The pantry allows you to store all your dry goods and snacks, and the front private bedroom with its king-size bed and 39" LED TV will feel ultra comfortable after a long day of excitement and fun. From its industry-leading maximum basement storage to its exceptionally large 20 cubic foot French door refrigerator, the RiverStone Legacy fifth wheel will undoubtedly deliver plenty of space and style! The fully enclosed underbelly and 12V heated tank pads are what allow the Legacy to travel year round, and with the 40,000 BTU furnace that has been installed, you will always feel warm and comfortable inside as you camp out during the cooler months. You also won't have to worry about finding a hot shower when you travel to secluded destinations because the continuous hot water system will provide hot water whenever you need it, and the Dyson cordless vacuum will be immensely helpful as you clean up stray crumbs from dinner or tidy up after a night of entertaining.